1.) Woods of Windsor's Roll On Deodorant is a royal family favorite, and it's easy to understand why. The spicy citrus scent, composed of lemon grass, bergamot, verbena, nutmeg, and cinnamon, is cozy and refined like a well-tailored tweed blazer. Perfect for fall, this scent is so addictive that you'll want the cologne as well. 2.) 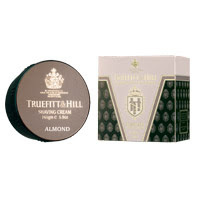 Established in 1805, Truefitt & Hill enjoys the prestige of a Royal Warrant of Appointment to the Duke of Edinburgh, and their Almond Shaving Cream lives up to the honor. Scented with creamy almond oil, this cream produces a rich lather when applied on its own or with a badger brush. A little goes a long way for a close shave that lasts way past 5 o'clock shadow. 3.) Botot Mouthwash, originally created in 1755 for King Louis XV, is an all natural herbaceous concoction intended to promote oral health. One swish in the morning and before bed will keep your teeth healthy and so blindingly white that you might earn the moniker heir to le Roi Soleil. Hi Beauty, your choices sound intriguing...may I suggest an Italian alternative? Acqua di Parma grooming products may not be associated with British royalty but they make you smell and feel like an Italian prince! I plan to do an Acqua di Parma inspired post this week, so stay tuned.